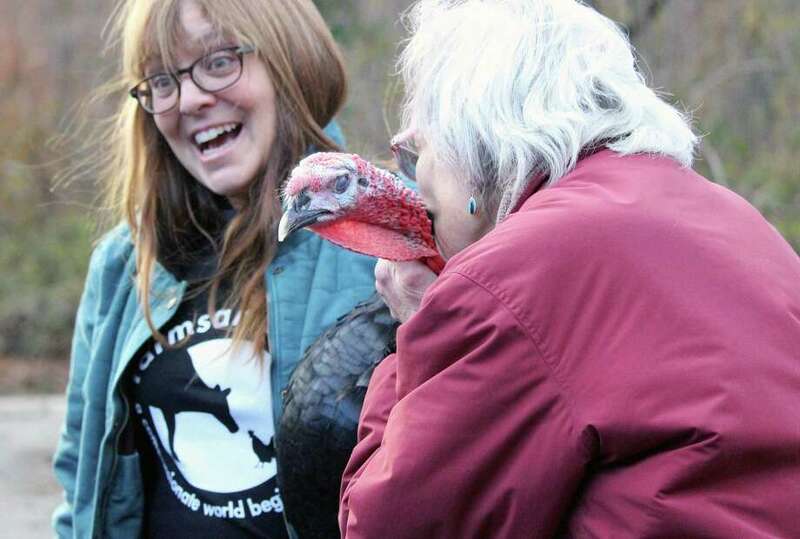 Joan Poster plants a kiss on Ringo, one of four turkeys rescued from an Arkansas turkey drop. Susie Coston, from Farm Sanctuary, delivered two of those turkeys to Poster’s farm in Fairfield on Wednesday. FAIRFIELD — Two turkeys arrived Wednesday afternoon at Joan Poster’s home, but they weren’t there to grace Poster’s Thanksgiving table. Poster, a well-known local veterinarian, is a vegetarian, and the two turkeys — John and Ringo — were part of a quartet of injured birds rescued from Yellville, Arkansas’ annual and infamous turkey drop. The turkeys were injured during the October event and found bleeding on the pavement. Some of the turkeys are dropped from a plane, while others were tossed from the top of the Marion County Courthouse. John, Ringo, George and Paul were rescued by Farm Sanctuary and brought to the group’s shelter in upstate New York. George and Paul are still recovering from their injuries. There are about 100 animals at the 17-acre farm, Poster said, if you count the chickens. There are 30 rabbits, goats, pigs, Clydesdale horses, a cow, some roosters and a peacock. And now, two turkeys. The two were delivered by Susie Coston, from Farm Sanctuary. She said PETA had a group of activists on the ground during the turkey drop and were able to convince the people who captured them to turn them over. Ringo, she said, was a Black Special, while John appeared to be a Narragansett, both of which are heritage breeds, and not wild turkeys. Heritage breeds, she said, are slower to grow, and don’t get as big as the industrial broad-breasted turkeys most are familiar with. Poster said turkeys live about five or six years, usually getting too big for their legs. This is not the first time Poster has offered shelter to rescued turkeys. In 2010, she welcomed Mordecai and Fiona, two Bourbon reds, who came from an organic farm. The Farm Sanctuary each year runs an Adopt a Turkey program, and its Turkey Express brings the rescued birds to their new homes. Poster has been adopting rescued turkeys since 1996. While wild turkeys can fly, it is usually just from tree to tree. Domesticated turkeys can only fly short distances. The turkey drop is held the same weekend as the Yellville Chamber of Commerce’s Turkey Trot, a festival to highlight the state’s spot as one of the country’s top turkey-producing states. Activities include a road race, music, dancing and a pageant. According to an Associated Press story, the chamber stopped the turkey drop in 1989, but the tradition was continued by local pilots. Dropping the turkeys from a plane is apparently not in violation of FAA rules, so long as they don’t cause damage to people or property. 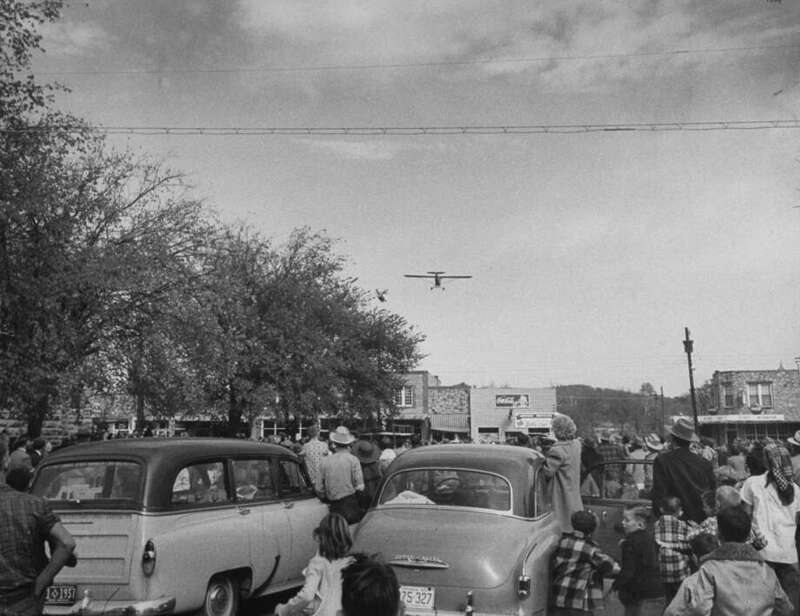 Turkey toss starts as first bird is tossed from low flying plane in Yellville, Arkansas in 1952. It has been said that the famous “WKRP in Cincinnati” Thanksgiving episode in 1978, where live turkeys were dropped from a helicopter, may have been inspired in part by the turkey drop in Yellville.